Scott Shellady helps the audience understand the derivative market and talks on investment strategy for both Baby Boomers and Gen Xers. 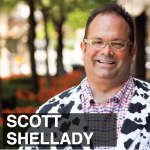 Scott Shellady is the Senior Vice President of Derivatives for the Trean Group. Scott explains to the audience what a derivative is and why it can benefit you in today’s market. He also talks to Jason on his SWAGER acronym, the retirement funds of both Baby Boomers and Gen Xers, the one precenters investing in the stock market, and much more on today’s episode. [2:15] When you teach a tenant to be an owner, it will ease your burden of managing them. [4:50] What is a derivative? [11:05] What is the acronym SWAGER? [14:15] What’s happening in the art market right now? [23:20] What should Baby Boomers and Gen Xers do with their money? [28:20] We don’t want to ignore the inflation problem. People should prepare for inflation. Hi there, it’s Jason Hartman your host and thank you for joining me for another episode of the Solomon Success show with Biblical wisdom for business and investing. Let’s go to today’s lesson and then I’ll come back on and then we’ll have our main portion with our guest relating to that lesson. For income property investors, managing our portfolio of real estate is a highly critical component of long term success. This requires that we have high levels of discipline and organization to ensure that our properties perform properly. Prudent management requires that we know about the condition of our properties and needed repairs. It also requires that we know about our tenants since our source of our success is providing is providing useful service in the provision of safe, reliable shelter to them in exchange for their monthly rents. In the third chapter of proverbs, King Solomon writes, “Honor the Lord with your wealth and with the fruits of all your produce and your barn will be filled with plenty and your vats will be bursting with wine. King Solomon is teaching us that the fundamental hallmark of long term success is to honor God and all that we do. This means that we must provide useful and meaningful service to our fellow human beings on our walk toward wealth and prosperity. By honoring God in this manner, we will create wealth from a spirit of abundance instead of scarcity mentality that has so many people in its grips. One of the ways that we can serve our tenants is to teach them how to think like owners. The importance of this mindset is that it will train them to take ownership of their personal and financial lives. One of the most important things that any of us can do for our long term future is to take personally responsibility for the trajectory of our professional and financial lives, by teaching this skill to our tenants, we will be serving a dual purpose of easing our burden of management and showing them the path to personal prosperity. The source that Jason Hartman has searched to teach us this critical land lord skill is his own mother. She has achieved success in her personal investing career by self-managing her portfolio of properties and fostering an ownership mentality from her tenants. Whether you self-manage or go the property management route, this is a critical concept to understand. In short, the trick is to get your tenant thinking of the property as his or her house and to take pride and ownership. In nuts and bolts terms, it’s the difference between getting a call at midnight asking to have a light bulb changed and having the tenant in the mindset to do it themselves. That was today’s lesson. Let’s get to our guest, but before we do that. Please regardless of what platform you’re listening to us on, whether it’ll be iTunes, Stitcher Radio or SoundCloud. Please go write us a review, we’d really appreciate that and check out the free resources at our website SolomonSuccess.com. Here’s today main segment. It’s my pleasure to welcome Scott Shellady to the show. He is Senior Vice President of Derivatives for the Trean Group and Trean is Irish for strength. He’s coming to us today from the greater Chicago area and Scott, welcome, how are you? I’m good, thanks for having me. Good, good. It’s a pleasure to have you on the show. Just in our little discussion before we started recording for the show, I can tell this is going to be an interesting interview and maybe I like to start off first by asking you, people talk so much about, at least, the doom and gloomers talk so much about the derivatives bubble and how they are hundreds of trillions of dollars in derivatives out there and I have never reconciled my mind as to why that is a doom and gloom scenario, because there is a counter party to every transaction and you had a great way of explaining that, so first of all, maybe Scott, do you know the estimated size of the derivatives market? I think it’s hard to even estimate, because there’s a lot of OTC transactions that aren’t registered or at least on a listing exchange. So, hundreds of trillions is right, but the total size is going to be very difficult to get your head around. I was just going to ask you also and I probably should have asked this first, maybe you can just explain what is a derivative. I mean, I kind of simply say it’s a thing about a thing is the thing about the thing, not the thing itself, just sort of jokingly, but explain to the listeners like, what is a derivative? You’re right, a thing about a thing. The best way to explain it would be if you have got say, corn, there’s derivatives on corn you can trade puts and calls and those things are kind of complicated and they get more complicated than that, but you can get, you know, buy the right to buy or buy the right to sell. Although they can be very difficult, but a lot of times it’s just like trading insurance, so I can buy something that protects me to the upside or I can buy something that protects me to the downside and every product out there whether it be fixed income, commodities or even equities have something like that and maybe some of them each have a derivative of a derivative, but we won’t go into that. That gets more complicated, but really it’s just kind of like insurance, but a lot of people use it as a way to add more return, or create more return for what they actually have in their portfolio. And so, estimated size of the derivatives market—I know it’s hard to tell, because some are over the counter transactions, but any thoughts on the size? Well, I think you said something like 500 trillion or something like that. I’ve heard as high as 700 trillion and just to put that in perspective, of course, a billion ain’t what it used to be. Now we talk in trillions, absurdities, thanks to the omnibus bailout programs, that’s how we have to talk nowadays. Just to give the listeners some perspective, I mean, the GDP, the Gross National Product or Gross Domestic Product of the United States of America, the largest economy in the world by far, is about I don’t know, 12-13 trillion, maybe. The GDP of the entire planet every year is about $60 trillion. Our unfunded mandate, or our unfunded entitlements, looking forward about 20 years, has been estimated between $60 and $200 trillion. So, I’ve heard derivatives market as high as $700 trillion. That’s just insane, how can we even think about this? Well, I think the reason the derivatives markets are there is in order to create leverage, and boy they have done that. That’s been their namesake, and they’ve been successful in doing so, and there’s been a lot of money lost and won on both sides of that. So yeah, that’s what they’re there for, better return, and maximized return, and somehow get some more bang for your buck for your portfolio. Should people be worried about – when you’re worried about the broader economy, should you be worried about how many derivatives are floating around out there or is it really a red herring? Another good question. I would say, as an old trader would have said to me, if you bet on the sun exploding, and you win, what do you really win? So I think that maybe you can get really worried about the size of the derivatives markets, but also I think you’re probably better served if you just go with the flow and manage your own finances with it, because you’re just going to be a fly on the windscreen of the derivatives market if you decide to kind of try to get in front of it. Okay, so it shouldn’t be something that people spend a lot of time worrying about, is that correct? Yes. I think you’d probably have more of a – you’d better start worrying about getting in a car or an airplane every day than you would about the size of the derivatives market. We talk about derivatives and a lot of people view those as like, these thin air sort of smoke and mirror asset classes. Where should people start when investing in tangible assets? Well, tangible assets, there’s kind of two different questions there. Tangible assets, a lot of times, people would be as simple as saying, there’s things that hurt when I drop them on my foot. And those are the things that would be deemed inflation-proof, or inflation hedges, against the dollar losing its value over years, against the fed printing more and more money. So, it’s something that I’ve talked about with other people, but I’ve got a little acronym called SWAGER and it’s silver, wine, art, gold, energy, and real estate. All of those things would be inflation hedges and you started to see some of them bubble up recently in some of the press. I just actually looked up what the wine market’s doing and that’s on fire as well. So here we sit worrying about how many dollars are being flooded into the market and it’s $85 billion a month, according to the fed and that’ll be a trillion dollars a year we’re adding to that balance sheet to try to stimulate growth in the economy with really no growth around the corner, but when we do start to see that growth, that’s when this inflation will start to take off, and that’s why some of these investors have started paying record prices, i.e., $140 million for a Francis Bacon painting a week or so ago and that’s going to continue, because that can be a good store of wealth. At the same time, you can actually have the object you bought go up in value. Now, you mentioned something earlier before we went on about, they’re also very liquid. So it’s something that you have to be very careful about. But going forward, we’re trying to inflate our way out of this problem, and in doing so, hard assets are going to gain in value, as well as stocks. The two things that have been gaining in value because of this fed’s inflationary pumping of money have been the real estate market, and equities. So, keeping that in mind, there’s a few things other than real estate, like silver and gold. Which, gold and silver both come off as of late that those inflation hogs are still there to buy it. We’ll continue to rally over time when that dollar starts to lose its value, because we’re printing so many of them. Yeah, no question about it. And so, real things, I mean, what I always say is that, things matter. They have intrinsic value. You know, money or we should say, currency, to be more accurate, is just a symbol of value and it’s backed by nothing anymore. So be careful of it. Own and control things that have universal need, intrinsic value. Those kinds of things are good. Now, you have this interesting acronym SWAGER, can you tell us about that? Yeah, it’s silver, wine, art, gold, energy, and real estate, and those are the things that you just mentioned. Those things have value, those things, maybe a store of value for folks that have extra money and are a little bit say weary of the stock market here, but it’s also a way that, really any one of those things if you dropped it on your foot may hurt, depending on how big your silver and gold bars are, but that could be a way of hedging yourself against a devaluation of the dollar. And why would the dollar devalue? Well, the dollar devalues when we continue to print so many of them. And then internationally they don’t look as attractive, just because of simple supply and demand on our own currency. So, with our currency being flooded with new currency, or new dollars, these types of things are a good store of wealth, or a good store of the dollar value, because, quite simply, if I paid ten dollars for that bottle of wine and the dollar wasn’t worth ten dollars anymore, the dollar was worth 50 cents internationally, then it would cost me $20 to buy that wine. Well, ten, I sell it at 20, I make money that way. See, it’s a store of wealth. That’s pretty much why you’ll see folks diving into that art market. You see gold bugs diving into gold. You see real estate people, both farmers and real estate speculators hoovering up land, because they think that the dollar is stronger today, so they’ll be able to buy more with it today, then they can next year or in five years’ time. So those are the types of things that a lot of people that have the extra money or want to, maybe say they’re worried about their dollar being worth less in the bank in five years’ time than today, they’ll buy something where they can store that value. Yeah, very good point. Well, a lot of people are arguing about whether we will have inflation or deflation. I mean, the vast majority of people say inflation, and I happen to be in that camp, but do you need a recovery to have inflation? I say you don’t. Because if you look at inflationary economies throughout history, I don’t think anyone would argue that Zimbabwe or Argentina or Hungary or the Weimar Republic were really recovering economies! But they still had massive inflation, right? And ultimately you can argue that it led to their decline. You’re right, so, you don’t – recovery is not a needed part of that recipe, but what is needed is a rampant printing of money where this loaf of bread and we’ve all heard that, the German, the load of bread is a dollar today and it costs me $100 next month. That’s rampant, rampant inflation and if you own that bread, rather than the dollars, you’re going to insulate yourself from that devaluation, and that’s what a lot of people are doing with SWAGER. You’ve seen that happen both in the gold market. Big reality now. It’s come off a little bit, but definitely with real estate, definitely energy prices, and as well as the art market. Yeah, so, what is going on in the art market? Is it going crazy? Yeah, they’re seeing all-time record highs for art and it’s partly because the one percenters, and this is another big discussion, but there’s a place that they can put, all the people that have that capital want to put it to store it, keep the dollar strong, or at least hedge themselves against an inflation, but at the same time, they’d also like to maybe benefit from a rising price, so there’s two things going on there. They so, only ever buy art if you really really like it, but I think that with some of the things I’ve seen being sold at some of the prices. I think it’s more of a store of wealth than something that’s actually pleasing to the eye. So, we’ve got a rampant art market, we’ve got a very healthy wine market, silver, and gold have also gone up over time. They’ve backed off as of late. And energy, we all know what’s happening with those prices, and you’re a real estate expert, so those types of things are really what people are looking to continue to put their money, because they don’t trust the stock market, see. So there isn’t a lot of flow in that area, and that’s something that’s unregulated, and illiquid, so those things need to be put out there to be, those are danger signs, but at the same time they also could be very good places to put some of your money but not all of it. I think the distinction that has to be made in art is that it has to be really, to have liquidity, and the market is small for it, but it needs to be really exclusive art. There’s a lot of this middle-market art, there’s this huge middle area of art that just, it just really has no market. I mean, if you go to the website, like www.artbrokerage.com, you can see the same pieces that have been sitting there forever, offered by the same sellers. It’s kind of crazy. I just don’t think there’s much liquidity in that. The value, they say oh, the value for your painting is $30,000, but is there a buyer? Well, that’s another old trader thing, nothing’s worth anything unless you’ve got a guy that wants to pay something for it. It’s only worth whatever the next bid is. Yeah, exactly. That’s the ultimate appraisal. It’s not having an appraiser come over and speculate. Right, so right now it’s going to be upper-end things and you can go – even, it’s the LeRoy Neiman-ish things that might give a little bit of a bid that way, but you’re right, there’s a lot of stuff in the middle area that is either replicated or isn’t, is exclusive, but those are the types of things that can help, maybe the average everyday investor puts a little bit of money towards something like a Neiman, but at the end of the day, we are putting so much money to work here that maybe when this inflation does pop, it pops faster than we all think, or at least we don’t see it happening when it finally really does. Very interesting. Well, what are your other thoughts on the economy in general? I mean, you don’t believe that we’re in a real recovery, do you? No, and I’m kind of in my own camp on that-a lot of people really want to see the world through rose-colored lenses, and when we have one good jobs number last November the 8th, and we have a retail sales number that was okay the other day, and all of a sudden we’re on the road to recovery. Well, every other economic figure that came out was bad. It was worse than expected. So, we’ve got a situation here where we’re putting $85 billion to work-I’ve said it a bunch of times, but I want to stress how much money that is-and the best we can do is a 1.5– 2% growth rate? I mean, aren’t we embarrassed? If I would have told you the input about what we’re doing to stimulate this economy, and put you in a vacuum room, you would have come out thinking, we’ve gotta be growing at 5, 6, maybe even 7%. But we’re not! So we should be embarrassed. I mean, this talk of taper frustrates me, because we’re still on such dicey ground.. So what you’re talking about is the talk about the fed tapering, that has been the theory or the threat, and they’re not gonna do it now. Now we’ve got a new fed chair coming on board, and I want to ask you about Janet Yellen too, but, they’re not going to taper, are they? Anytime soon? Well, the tapering is of the $85 million, are they going to pull that away, or how they’re going to pull that away. But if they pull the punch bowl away from the party per se, and we’re only managing 1.5 – 2% growth now, the argument would be that the reason that they’d pull it away is that we’re doing better and the economy can stand on its own, but I don’t think anybody can sit here and say the economy can stand anywhere on its own, because of 7.3% unemployment rates, 48 million people on food stamps, I mean, we’re setting some records here, which are the opposite of the stock market record we set today. So we’ve got two different worlds we’re living in. And unfortunately, we’re trying to bring the gap between rich and poor closer, but by accommodating the economy with this money that we’re doing in every month, the people that own stocks or the people that own real estate, or maybe the people that can afford to invest in SWAGER, are the ones that are benefiting from all this money being put to work. And I think it’s leaving a lot of other people behind. I think it’s leaving Main Street behind. And that’s why a lot of these economic figures are coming in so poor. Those are all Main Street numbers: foreclosures, I know that they’re declining, but that just means less people are going bankrupt; that’s not really a good thing. I mean it’s starting to re-heal a little bit, but you’ve got other economic figures that are showing, we’re just not really getting off of our chairs and getting this thing back to work. So, a large part of the economy, which could be arguable the 99%ers, still are feeling the doldrums of 2009! So we’ve got two economies happening here, and unfortunately what the fed’s doing is really only benefiting one of them. Which is very interesting, about how that’ll all end in the next five years. Yeah, that’s interesting. So, do you think Janet Yellen will be more loose than Ben Bernanke and Greenspan, the ultimate Keynesian? Well, maybe Ben Bernanke is, I don’t know who’s worse. But, do you think she’ll even be more liberal in her quantitative easing? Or do you think she’ll pull in the reigns at all? I mean just even a little bit. You know, everybody wants her to pull the reigns in, and everybody thinks they know who she is. And I think for every fed chair we all thought we knew who they were. But in the end, we didn’t. But I will say this, she’s entering – I mean, she’s entering a situation where, we haven’t even touched on Obamacare is arguable between 18 – 22% of our GDP. If that doesn’t go well, she’s going to have 20% of her GDP take a little bit of a knock. At the same time, you’ve the high unemployment rate, maybe – we’re going to need to see a bunch of job numbers in a row to change any of these bad feelings. There could be a situation or an argument made that she might even put her foot on the gas and accommodate the economy more. Now, on a percentage terms basis, Japan’s putting more work in their economy, percentage wise, than we are for ours. So you’ve got some doves that will – doves are people that think hey, we can put more money into the economy, we can cut interest rates more-those folks think that hey, we can do just that, because look at what the rest of the world’s doing! All these central banks are on a race to cut interest rates to zero and accommodate their economy with all this cash. So, there could be a chance. I mean, there could be a chance. It’s not talked about wildly right now, because the market wants her to taper, or at least pull back on the money being put into the system. There’s a chance that she actually puts more in. Yeah, yeah. So, that means more inflationary pressure, folks. You heard it right there. So, what do you think about the stock market? I mean, the Dow recently hit new highs. What’s such a joke about this, CNBC, and putting the big notices on the screens-they never adjust for inflation. It’s so ridiculous. I mean, when it just got over 15,000 I said, hey, nothing has happened yet! It’s gotta be at 15,800 by my calculations before you even break even. You’re right and I’ve been doing it for 26 years, and you know, in 1996 we heard Alan Greenspan’s irrational exuberance speech, right? Well, I’ve renamed 2013 Irrational Apathy. There were no media, there were no news trucks, we didn’t have anybody really cheerleading the rally, because a lot of folks, and rightfully so-they feel as though because of the money being put to work in the economy, and the money managers that have your 401k, my 401k, everybody else’s 401k, feel this pressure to get involved in the stock market; they don’t want to be left behind. So we have this self-fulfilling prophecy of this rally to the upside. And it feels manufactured. And I think that’s what most people are really out there feeling. But just because it feels manufactured, and you and I both may think that, doesn’t mean it can’t continue on for another two years. So like I said about what we were talking about earlier, sometimes knowing what you think should happen versus what’s going to happen, you can save yourself a lot of money by trading what’s going to happen, or at least working around what’s going to happen, and trying to benefit from that, rather than being the fly on the windshield and be dead right. Jason: Very good point, very good point. So, what do you think the strategy is for Baby Boomers and really, Gen Xers now need to start thinking about-I mean, if they’re older Gen Xers, they’re getting close to where they have to start thinking about getting serious with their money and protecting their retirement. What can they do to shore up their finances so that they’re not just left empty-handed at retirement? Oh gosh, the answer isn’t one anybody is gonna want to hear, because it affects me as well. But at the end of the day, you know, I own a money management firm, and we talk to people all the time, and folks that are Baby Boomers are now starting to retire; and we’ve got a wall of Baby Boomers that are gonna be coming through, and they can’t really afford to have the stock market back up 20 or 30% on them and have some cataclysmic, catastrophic crash. So, they’ve been backing money out of the stock market, and really the only place they can put it to keep it safe is in bonds. Well, a 10-year bond is tied to the 2.8% for 10 years, which is still ridiculous, ridiculously low. And I’ve written a piece about this as well. Unfortunately, we’re going to see more 90 year olds serving us ice cream at Dairy Queen, and I might be one of them, but the best way to shore up some of these portfolios is that we’re going to have to work longer. I mean, there is no, there’s no easy way out. I can’t look a 70-year-old person in the face and say, I need you to be 50-50 stocks bonds. Because that would be just a disaster to their portfolio if we had a real big back up in stocks. There are even people out there now, predicting Dow 2,000. I mean 2,000? That would be a complete collapse. I mean, I don’t know. I don’t think they’ll ever allow that to happen, because they can just print more fake money! And you know, it might be 2,000 real value, in real dollars, but not in nominal. And I mean, where those two lines cross, and those lines are this: when the government’s continuing with its accommodation versus when that growth comes. You know? So, they’re going to accommodate to some degree until we can finally see that growth, and then things’ll get safer, and then I can say to the 70-year-old, well you know what, you can have a little bit more in equities now because I think this is healthier. But right now, there really is no good answer. I mean, the best answer is that you’re going to have to put into your plans working longer and longer than you ever thought, in order to save and in order to be okay in your older years. Because-and I’m one of them, I’m not trying to tell anybody that I’m not. I’m 50, so, we’re going to have to do that in order to stick around. Because I can’t really take a huge hit to my 401k if I’m getting out in 15 years. investing heavily in stocks right now. And there really isn’t a cheap answer except for, we’re going to have to work longer. And I hate to say it, but that’s…. You know, I really don’t think that’s such a terrible thing. I mean, the whole concept of retiring at 65 was created – it’s an industrial era, it’s an artifact. It shouldn’t be that way. People should be working longer and I don’t say that as like an obligation – they should want to. You retire, you die. I mean, it’s proven that when people retire, they don’t have a purpose. They don’t have a sense of purpose, usually. Now, sometimes they have some other big fulfilling sense of purpose. I mean, but the point is, to stay engaged, stay interested, and to work because you want to, not because you have to, because it’s interesting, because you feel you’re contributing to the world, you’re contributing to yourself, you’re growing, you’re thinking, you’re engaged, and it keeps you sharp. Hopefully not because you’re an indentured servant and you’re a Walmart greeter, okay. That’s not..
And you know, to your point that industrial age retirement as a percentage of life expectancy, we should expect to work longer, because we live a lot longer now. Back in the days when Social Security was put forward, those – we need to start making those expectations, and we’re building those into our customers’ plans as well, and generally speaking I think a lot of people have come to accept that anyway. So, here we sit in an environment where we’ve got a manufactured stock market, we’ve got very very cheap money for ten years, so it’s going to be difficult for you to pile all your money into that ten year interest rate, and your bond lenders are going to look not good, so that’s going to be pretty much the commonsensical solution where you’re going to be able to store some wealth, maybe if you can afford it, buy some of the things we talked about with SWAGER, but at the end of the day you’re gonna have to work a little bit longer. You don’t have to work your 80-hour work weeks, but you’re gonna have to keep some income coming in. It’s not, it’s not something you’re going to have to have a ball and chain around your ankle, but you’re going to have to keep some income coming in. Yeah, right. Exactly. Well, any other points you’d like to make? Predictions on the future, just ideas you want to close with, any other thoughts? You know, I do think, I do think we need to talk about, and this could be another talk sometime later. But we need to talk about that inflation problem, which I think will rear its ugly head before we actually know it, because there’s going to be some point in time where things do catch fire, and maybe it’s three or four jobs numbers-three or four months of good jobs numbers, where that does finally happen-but people have got to be ready for that, a) in their borrowings, because a lot of people might be going month to month on some sort of interest rate, but you’re going to see those types of things-make sure your borrowings can handle a doubling of the interest rates. See, that’s a big deal. Percentage change versus the actual change. Well, 2 to 4% doesn’t seem like a big deal, but it doubles your payments, so you have to keep those types of things in mind. So keep in mind a sudden change to inflation, I think you’ll be okay, because that really is the thing I think that is going to erode peoples’ wealth going forward. So, long term fixed rate debt, hopefully attached to some of the SWAGER items. I love it when it’s on real estate, because inflation actually works for you, it pays your debt off for you in that case. It devalues your debt, which is awesome. That’s what we want. But it’s gotta be fixed rate, folks, because it’s just too risky to have adjustable rates in this kind of uncertain market. Good stuff. Scott, give out your website, tell people where they can find you. Well, we’re at www.treangroup.com, my face will be on the front page there. You can get in touch with me on that one. That’d be probably the best and the most easiest way. And I just want to spell that for everybody. It’s www.treangroup.com. Good stuff. Well, Scott, thank you so much for joining us today! What Does the Bible Say About the Stock Market?